Your career is important. It provides financial stability for you and your family, and in many ways, it can dictate your future — where you live, what you can afford, and the type of lifestyle you're able to lead. When there’s a possibility for career advancement on the horizon, it’s good to be able to spot it early. That way, you won't risk jumping ship too early or passing up on a great opportunity. 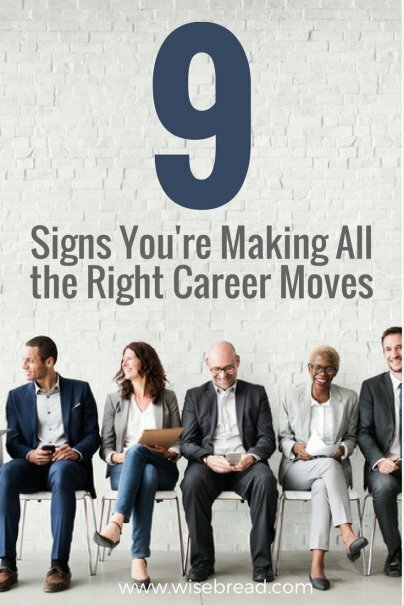 If you see these signs at work, that's good news; you're making all the right career moves. If you are brought into a meeting with the boss (and possibly human resources) and told you’re getting a raise, then congratulations … you’re climbing the ladder to success. Is your calendar getting fuller? Are you now in meetings with those “higher-ups” that you’ve only heard mentioned in annual reports and water cooler talk? Well, get ready for the big time. When your boss decides that you should be put in front of people that make important decisions, she is doing so because you will make her look good. She wants to show you off and attach herself to someone who is clearly making all the right moves. This, of course, may bring additional pressure. You don’t want to mess up in front of the executives, so take the time to prepare yourself, know your stuff, and be on your best behavior both in and out of important meetings. Being put on a key initiative the company is working on says a lot about your chances of a promotion. Every business, large or small, has that one major development or client; and they only put their top people on it. If you are asked to join the team of Project X, you know you’ve just been given a great deal of credit. Most likely, how you perform on that project, under pressure, will determine the promotion and raise your boss is planning to give you. So, don’t let him or her down. A boss usually works longer hours than the team, although there can be exceptions to that. However, if your boss is getting in early, leaving late, and still wants to spend some of his extracurricular time getting to know you, that’s a good sign. For instance, being invited to lunch to discuss your role and your contributions to the team is great for you. If your boss asks you to play a round of golf over the weekend, that’s another great sign that you’re being considered for a bigger role. He is looking to get to know more about you than the day-to-day work stuff. How’s your family life? Are you happy in your position? How do you treat people when you’re out of the office? You’re being eyed up for a promotion. Of course, if there is any hint of impropriety, and this feels like anything other than business, talk to HR immediately. One of those tricky interview questions we often get is, “Where do you see yourself five years from now?” That question takes on a different meaning once you’re within the company. Here’s a cold, hard fact: Businesses do not like to invest in people that are not important to them. Budgets for conferences and business trips are watched carefully, and a select few get to take advantage of these benefits. If you’ve gone from sitting in an office all day to jet-setting and attending industry events, all on the company’s dime, you’re sending the right signals to management. They are investing in you, and they want you to stay. Are you suddenly the apple of everyone’s eye? Are people actively coming to you just to tell you what a great job you did on that last big project, or asking you to help them on other projects? Do your co-workers, some of whom have been fairly cold or hands-off in the past, now want to hang out at lunch? Well, guess what? Someone, somewhere, knows that you’re popular with the people that matter. They want to be associated with a winner. If people suddenly stop talking to you, and you cannot get anyone to return a call, that’s a sure sign that the opposite is true — you’re on the way out. When your boss starts hinting that she is about to get a cushy new role within the company, don’t panic. While it may seem like things are about to change, they could very well be changing for the better. Promotions have a knock-on effect, meaning that the boss’s shoes will be filled by a direct report. If that’s you, or you’re one of the contenders, you are almost certainly in the running to fill that spot. All you have to do now is prove you can do the job. Volunteer for more tasks. Assume a mentoring role in meetings. Look the part, act the part, and chances are, you’ll get the job. Even if you don’t, your relationship with your boss could be an asset in the future. Perhaps there are other projects or roles she could refer you for, in which case her newly enhanced status makes you look even better. If your company has a review or appraisal system in place, you can quickly see what your chances are of a promotion from the grades and comments you get. For example, if you’re judged on a scale of one to five for specific skills, and you are hitting mostly fours and fives, you’re excelling. This is used as a bargaining chip by your boss when it comes time to recommend departmental promotions.